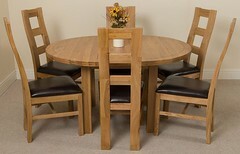 Thank you for purchase our stylish range of Oak Furniture. We are confident your purchase will delight you and become a mainstay in your home for years to come. 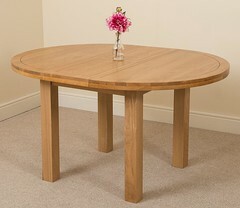 The following guide is divided into sections which detail the characteristics of Oak Furniture and is designed to help you differentiate between these characteristics with the product and any issues you may face with your product. 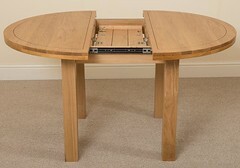 As Oak is a natural substance, it will react to differing environments during the journey from our supplier to yourself. This can result in the furniture experiencing changes to the ambient temperature which causes swelling e.g. making drawers difficult to open/close initially. In the vast majority of cases this will settle within a few days once the product has acclimatised to its new environment. Once your purchase has arrived and you have assembled the product, there are a couple of things we strongly advise when the product is in situ. Firstly we recommend treating the product with wax polish/Danish oil immediately after set-up and periodically after then (every 6 months or so) to help the product acclimatise to the new surroundings. In addition to treating the product, there are a couple of things to ensure when setting up, we advise not to place the product near direct sunlight, heating, air conditioning vents or radiators. We also stress that you do not place the furniture in a conservatory as this will cause excessive drying out of the wood. Any issues with products found to be stored and used in conservatories are not covered by the products warranty. Oak wood may darken over time, taking on more amber tones. This happens due to exposure to oxygen and UV light, making it a largely unavoidable process. When it comes to oak furniture, most people won’t even realise the change is happening, as the colour change is fairly subtle (unless an item is consistently exposed to direct sunlight). 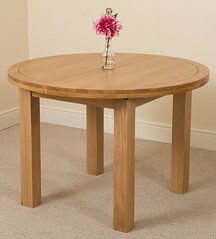 Oak wood is generally straight-grained and has an uneven texture. However, there will always be variances in the grain between products (even if the items are from the same range). Due to the nature of Oak Wood there will also be darker knots within the grain which can be quite noticeable depending on where they are located. This image shows the darker whirls within the grain of our Rustic Oak. The below image shows the darker whirls within the grain of our Light Oak. This final image shows multiple areas with larger dark knots within the grain. 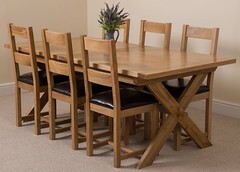 In addition to variations in the grain, all of our Oak Furniture will have knots in the grain which can vary in size and appearance as well as adding to the individual charm of a product. Knots simply mark where a branch was once growing on the tree when it was growing and is classified as a natural characteristic of the product. Wood rays (also known as medullary rays) are ribbon-like radial markings that extend across and perpendicularly across the tree’s growth rings. Far from being a fault with the product, it is an indication of the life the tree had before as well as the time and labour of love that has gone into the crafting of the product. The below image shows an example of what the medullary rays look like. Due to the process our products undergo during manufacturing as well as differences between different batches of the same range, we always advise that your product will differ from the image on the website in terms of colour, knot and grain patterning. This also applies to products from the same range so please bear this in mind when looking to match existing purchases. 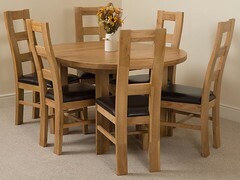 We hope that your Oak Furniture will be a focal point for your room for years to come however if you do have any questions or queries regarding your product you can contact us directly either via email or by phone.